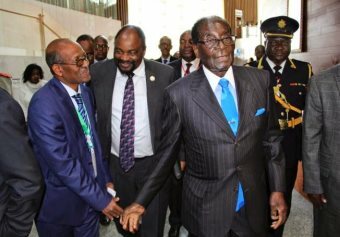 AFRICANGLOBE – The corporate media does not cease to amaze with their obsession of reporting negative things about President Mugabe, ignoring to tell their readers that the President is a respected statesman who commands respect in Africa and the world over. It is a fact that President Mugabe has been receiving a hero’s welcome and standing ovations in various gatherings, summits and meetings that he attended in respected international organisations like African Union (AU), United Nations (UN), SADC and everywhere across the globe because of his principled pan-Africanist stance. He always gets respect from the downtrodden people as they are aware that in him they see the voice of the voiceless. His stance on the economic empowerment of the Black indigenous people is not questionable. For that reason, since the turn of the 21st century, President Mugabe has been called names and demonised by the international community just because of his stance that political independence is nothing without economic independence. He has stood firm on that ideology, a fact which has endeared him to the less privileged of society who clamour to be owners of their indigenous resources and economic independence. Surprisingly, the corporate media who are funded by the country’s enemies would like to discredit President Mugabe at every turn. Often-times they will distort the truth will be overstretched to suit their regime change agenda. The private media has nothing constructive that they see in the President, though he is one of the forefathers of total emancipation of African people in the mould of Kwame Nkrumah. The private media has abandoned one pillar of their journalism ethics that calls for objectivity when it comes to President Mugabe yet he is a hero to some in the world hence, the hero’s welcome he has received in different parts of the world. The private media is quick to report about some pockets of demonstrations against President Mugabe that could have occurred rarely in comparison to his good work. The problem is that some opposition political parties in the world in general and Africa in particular have a tendency of rejecting results of election that they would have lost and in such situations they plan demonstrations against leaders supporting the ruling parties that could have won elections. So, the recent demonstrations by disgruntled and losing supporters of the Zambian Unity Party for National Development (UPND) led by Hakainde Hichilema should not be drawn out of proportion as the people who gathered outside Raddison Blu Hotel were just a minuscule and a tiny fraction of those who welcomed President Mugabe at Heroes Stadium in Lusaka on Sunday 25 January 2015 during the inauguration of that country’s new President Edgar Lungu. It was surprising that the same corporate media chose to ignore the hero’s welcome that was bestowed on President Mugabe on that day but chose to dwell more on the demonstration by few losing supporters of Hichilema. Anyway, it is expected the world over that those who lose elections refuse to join the victors in celebrations hence the demonstrations by Hichilema’s supporters was not surprising. Just some few days ago during the inauguration of the new Mozambican President Filipe Nyusi in Maputo, supporters of the Mozambique National Resistance (RENAMO) and its leader Alfonso Dlakama boycotted the inauguration but that did not stop the event. The Mozambican government was not disturbed by such a boycott when the Front for the Liberation of Mozambique (FRELIMO) knew quite well that it has overwhelmingly won elections. As such the demonstration by Hichilema’s supporters on January 24, 2015 against President Mugabe’s arrival in Zambia for that country’s inauguration of her new President Edgar Lungu has no significance in the body politic. President Mugabe rightly received a standing ovation when he delivered his speech on Sunday, during the inauguration of President Lungu where more than 40,000 people thronged the Heroes Stadium in Lusaka, dispelling the notions that those who demonstrated against him represented the thinking of all Zambians. It is surprising that the private media chose to ignore such an important occasion only to dwell more on the wayward demonstration by a handful of losers. The UPND supporters who demonstrated against President Mugabe were so few and for the private media to qualify them as representing Zambians is surprising if not confusing. In actual fact their demonstrations did not stop President Mugabe from doing what he was sent by the SADC bloc to do as the current chairman of the regional organ. The people who gathered outside that Raddison Blu Hotel were outnumbered by those who cheered and welcomed President Mugabe during the inauguration thereby putting to rest the malicious reports by the private press that those people represented all the Zambians. It is naive and confusing for the private media to dwell on non-productive stories when it is necessary for the same media to write factual stories that can build the nation. Churning out unproductive stories to the public by the private media is a cause for concern at a time when the public is expecting informative and constructive stories from the media. For that reason those who thrive on writing and sensationalising stories to just sell their newspapers should be ashamed as false stories are not only malicious but inhibit nation building. At any rate, shorn of the politicking, true African patriots know that President Mugabe is a hero for what he has done to locals and the image he presents for Africa that continues to fight oppression and imperialism. “I have always been interested in the socio-political economic developments in Zimbabwe. He further stated that the anti-colonial and liberation struggles in Zimbabwe, as in other countries, were waged in order to recover land and natural resources which had been stolen by colonial settlers. The admiration by African patriots of President Mugabe is unshaken and it is only quislings and their sponsors who seek to try to deny that heroism.